The US bank prime rate stayed at 3.25 percent, where it has been since the beginning of 2009. Despite the calmness of credit card rates in recent weeks, there was a development in mid-March which could have important implications for credit card rates in the future. On March 16, the Bureau of Labor Statistics released its report on the Consumer Price Index (CPI) for February. This report showed that inflation, as measured by the CPI, increased by 0.4 percent in February. If continued over the course of a full year, a 0.4 percent monthly rate of increase would result in annual inflation of nearly 5 percent. There's not yet any reason to expect such a sharp rise in prices; one-month inflation readings are often volatile, and February's surge follows four months of very quiet inflation numbers. Still, the inflation trend bears close monitoring, because the jump in February's CPI was led by gasoline prices, which increased by 6 percent in a single month. Gasoline is not only an important component of the CPI, but it can also influence prices in other sectors as well. This is significant for credit cards because lenders always keep a wary eye on inflation, and will raise interest rates if they feel it is necessary to protect themselves against rising prices. So far, it looks as though credit card companies are not going to over-react to one month's inflation reading, but given recent limits on how and when they can raise credit card rates, they may not tolerate too much inflation before starting to act. Consumer non-rewards credit cards rose by 8 basis points, to 15.11 percent. 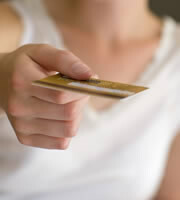 Consumer rewards credit cards were unchanged at 17.66 percent. The average for consumer credit card rates overall rose by just 2 basis points, to 16.89 percent. While the increase in non-rewards credit card rates was slight, it continued a trend which has been in evidence throughout 2012 so far, and that is a narrowing of the spread between consumer rewards and non-rewards credit card rates. With rewards credit card rates holding steady while non-rewards rates rose, this spread has now narrowed to 2.55 percent. It had been 2.96 percent when the year began, and 2.55 percent is as narrow as this spread has been since mid-August of last year. Student credit cards remained unchanged at 16.98 percent. This stability gives students an excellent opportunity to shop around and compare credit card rates, which is an exercise well worth doing. Even at the lowest rate tier, credit card offers for students range from a low of 11.99 percent to a high of 19.80 percent. Both categories of business credit cards were unchanged in late March. Business non-rewards credit card offers remained at an average of 14.74 percent, while business rewards credit cards remained at an average of 15.53 percent. With very little change in consumer credit card offers, the difference in rates for consumers with top credit ratings and those for consumers with average credit changed just slightly, widening by 3 basis points to 4.26 percent. 0 Responses to "Credit card rates edge up for no-frills cards"